Time Marches on, that's how Metallica follows up the chorus to one of their greatest songs and one that may apply more than Hoffman's other rock favorite - ACDC's Hell's Bells. 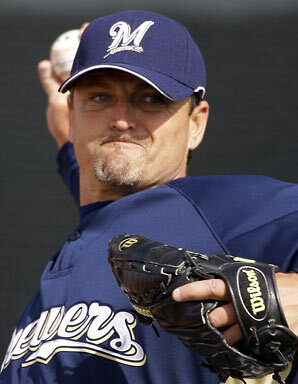 But time has marched right past future Hall of Fame closer Trevor Hoffman. While it would be an understatement to say Trevor Hoffman is off to a bad start in 2010, it would not be an overstatement to say he has been an ineffective closer. Hoffman has only blown more than five saves twice in the last decade and both seasons he coughed up seven chances. This year he has five blown saves and it's only May. Hoffman has never given up more than seven home runs before July in his entire career. He's given up seven through his first 14 appearances. That's more home runs than every other pitcher that has made an appearance for the Crew this season, except Randy Wolf and Dave Bush... both starters. In his career, Hoffman has never had more hits than innings pitched. Through his first 13 innings of work he's given up 21 base hits. Hoffman's ground ball to fly ball ratio is .41. That is the worst he has had since the stat began recording in 1999. In only six of his 14 appearances, Hoffman has pitched a scoreless frame. He's also had to use 15 or more pitches eight times. Hoffman has allowed hitters to slug .881 off him. That is not only shocking but nearly unbelievable. No Milwaukee hitter is slugging higher than .564. Those numbers should be enough to give Manager Ken Macha pause before sending him out for another save opportunity. Will they? Probably not, Macha will sink with the ship he is captaining, but that talk is for another day. Hoffman simply doesn't have it anymore. He looks like Jerry Rice with the Broncos or Michael Jordan with the Wizards. He's become a shell of the pitcher he once was but he remains in a position to hurt the team more than any other single player can. But what can the team do? How do you pull the plug on a Hall of Fame career? The way this season is progressing, there will come a point where General Manager Doug Melvin has to make some players and likely the Manager very unhappy. That point may come sooner for some (Macha, Jeff Suppan, Doug Davis) and later for others (Hoffman, Gregg Zaun, Jim Edmonds), but if things don't turn around quickly it will arrive soon. Who does Milwaukee go to then, if Hoffman pitches his way into middle relief. The options don't look great. Todd Coffey had been solid before getting lit up on Monday night. Carlos Villanueva has been, for the most part, spectacular - but his velocity strikes fear into the heart of no batter. Latroy Hawkins is hurt, and has struggled mightily as a closer in the past. Manny Parra might have been an option, except he's found his way back into the starting rotation. So who does that leave? Chris Smith has been spectacular for Nashville, saving 13 games with an ERA under two but if you saw him pitch last year you don't want to see him closing out games in the big leagues. Next on the list would have to be one of two prospects, Zach Braddock or John Axford. Both pitchers throw hard and have shown very good command in 2010. 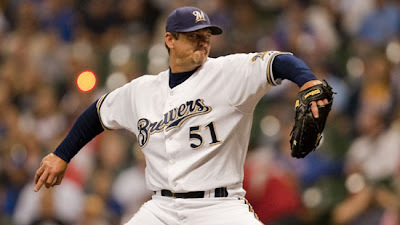 Axford has already made it to the big league roster and is well liked by the organization. Braddock has been outstanding aside from one very rough outing, but there are questions about his durability. He may be viewed as a future closer by some but he's had trouble staying on the field throughout the minors. Even this year in Triple-A he has yet to pitch on back to back days. I have no doubt he could help the team but can he close yet? That I do doubt. The other question regarding both of these young pitchers is whether or not the team would be willing to put the ball in the hands of a rookie during a season the Brewers have playoff aspirations. My guess is no, but desperate times call for desperate measures. The most likely course of action will be to move to a closer by committee, riding the hot hand while giving Hoffman a chance to work out whatever problems he has, if they are fixable. That would give Coffey, Villa and anyone else pitching well a chance to help the team. I'd like to see what the rookies can do. A hard throwing closer can give the fans something to get excited for while getting a feel for what young players can bring to the table in years to come. Ernest Hemingway borrowed from John Donne when he titled his book "For whom the bell tolls." The line is followed with "the bell tolls for thee" - Donne was talking about death, so that doesn't apply to Hoffman, but it may apply to his career.